This Nov. 5, 2014, file photo shows Eminem in New York City. A New Zealand judge ruled Wednesday that a political party breached copyright by using a song similar to Eminem's "Lose Yourself" in its campaign ads. A New Zealand judge said Eminem's lyrics "You own it, you better never let it go" turned out to be prophetic after ruling a political party breached copyright by using a song similar to Eminem's "Lose Yourself" in its campaign ads. High Court Judge Helen Cull on Wednesday ordered the conservative National Party to pay the Detroit rapper's publisher 600,000 New Zealand dollars ($415,000) plus interest. The case earlier featured odd moments such as gowned lawyers listening studiously to profanity-laced rap and Eminem collaborator Jeff Bass flying in from Detroit to play the song's distinctive opening riff, which he wrote. 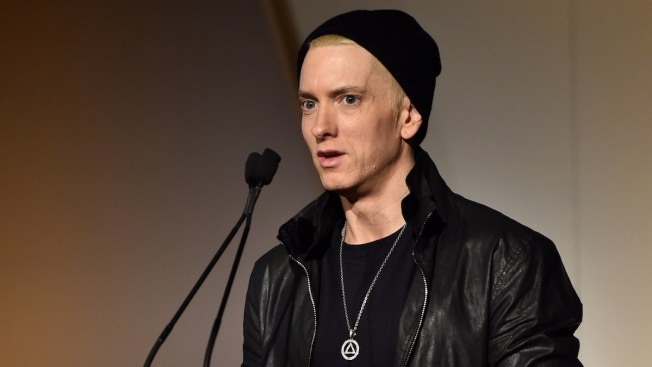 "We think it's a very strong judgment, and a cautionary tale for people who make or use sound-alikes around the world," said Adam Simpson, a Sydney-based lawyer who represented Eminem publisher Eight Mile Style. "We hope that we see more original music in advertising as a result, and that writers get properly acknowledged and rewarded for their hard work." Speaking by phone from Detroit, Eight Mile Style publisher Joel Martin said he'd been infuriated during the trial by the defense's absurd contention that "Lose Yourself" wasn't original because it used the same chords as other songs. "They could have said anything but question its originality," he said. Martin said he hadn't yet discussed the ruling with Eminem, aka Marshall Mathers III, but was glad the rapper hadn't been needed to travel to New Zealand "to watch the paint dry in the court room." The National Party ran a television ad 186 times that used the song "Eminem Esque" during its successful 2014 election campaign before pulling the ad off the air. In her 132-page ruling, Cull said "Eminem Esque" sounded like a copy and was a copy, reproducing the essence of "Lose Yourself." She said it was no coincidence the composer of "Eminem Esque" had the music to the original in front of him when he wrote his song. The judge based the amount of the award on a hypothetical license fee that the party might have paid to use the song. She noted that Eight Mile Style rarely grants permission to use "Lose Yourself" in advertising. Cull stopped short of awarding additional damages, saying the party had only used the song after receiving professional advice that it could do so, and hadn't acted recklessly. She has yet to rule on who will pay the hefty legal costs. The National Party was ridiculed back in 2014 when the case was first filed and lawmaker Steven Joyce defended using the song, an action he said was "pretty legal." "Pretty legal? That's not a concept that exists. That's like being sort-of dead," TV show host John Oliver later joked on "Last Week Tonight."